It's been an interesting week, with Rob Liefeld publicly blasting DC's editorial "meddling" and artists from all over the comics community lining up on one side or another of the issue. It's sparked a lot of conversation, from George Perez's experience on Superman to fruitless speculation as to whether Judd Winick and Ed Brubaker are really stepping back from corporate comics for the reasons and in the fashion they're naming. But a Robot 6 blog, its comments thread and a follow-up story at Bleeding Cool have all coalesced to paint a picture of a DC Comics that was much more actively engaged in the nuts and bolts of their writers' storytelling as far back as 2006's massively-popular event maxi-series 52. Mark Waid, who wrote 52 along with Greg Rucka, Geoff Johns and Grant Morrison in those heady days before Morrison was Chief Creative Officer at the restructured DC Entertainment, was discussing "grim and gritty" superhero comics, something he's often criticized, both outside of his work and within it. When a fan questioned his credibility on the issue by pointing to a controversial sequence in 52, Waid not only denied responsibility for the issue in question but noted that after he refused to write it in the way editorial wanted to see it, the other 52 writers stood shoulder to shoulder with him in refusing to do so and were ultimately rewritten, either by editorial or by a nameless writer at editorial's instruction. “BUT WAID’S HAD PEOPLE STABBED IN THE BACK WITH SWORDS, TOO!” There, internet, I saved you the trouble. In a fruitless attempt at preventive maintenance, I’ll likewise stipulate that over a 25-year career, I’ve had characters do some pretty violent things now and again, myself. I would, however, at least like to believe that I don’t use that tool to gratuitous excess. YMMV. When you hear me complaining about Swords Through The Back these days, that’s just my shorthand way of saying that it’s a trope I now find overdone across the medium–a too-easy go-to. Writing evil and writing violence are, if you’re clever and do it right, can be two entirely different sets of visuals. 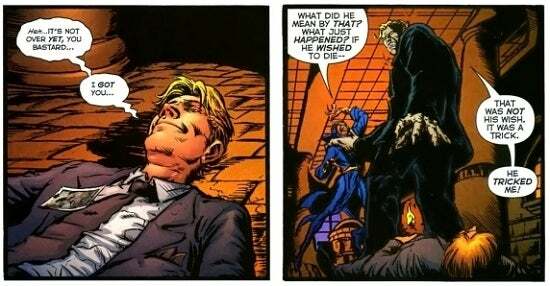 Also, to the issue of "I think Waid wrote the story in which the Elongated Man was 'brutally killed. '–for the record, no, the entire back half of that one sequence (52 Week 42?) was the one sequence in the entire series that was actually written not by any of the 52 writers; I haven’t the time or inclination to get into the whole backstory right now, but after handing in numerous last-second rewrites on “Ralph’s End,” all of which were 180 degrees from what we’d been telling our bosses all along what we were building to and all of which still allowed Ralph to die with, apparently, too much intelligence and dignity, I gave up. I told the editor I couldn’t do what was being asked, and the other three 52 writers (to their credit) stood in solidarity with me and wouldn’t touch those pages either. Those sorts of changes are, of course, absolutely the full prerogative of editorial to make. No argument. Their sandbox, etc. If you’re freelancing for any company, they can change the work however they please, their right. I just wish our four names weren’t on a comic that, in large part, none of us actually wrote. Dan DiDio, who reportedly was never particularly happy with a number of elements of 52 and struggled with the writers throughout, is probably the odds-on favorite as the editorial slaughterer above, although don't look for Waid to go all Liefeld on him and name names. Questioning Waid's credibility on the issue is frankly a bit silly; as he noted, it's virtually impossible to have a long career in a genre that revolves around violence and combat without killing people every so often, but he's the guy behind Kingdom Come and has expressed genuine regret on at least one occasion when he stooped to killing a character in a way he later questioned himself. But the conversation that sprung out of it is an interesting look behind the curtain and a reminder that these properties, which are extremely valuable to the parent companies of the publishers, have been subject to incredible oversight since long before the New 52.